my own Stam bag | escaped. I've had my eyes on this one bag for years now - the first time was ever since I saw it on Purseblog. 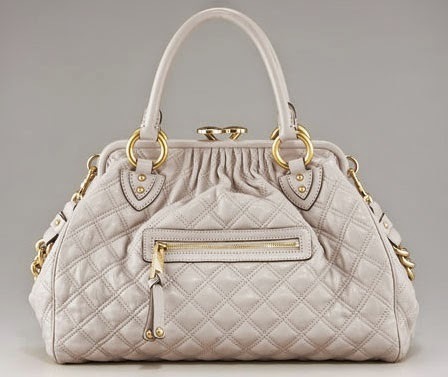 It has quilted leather in so many colors, but my favorite back then was this soft blush color. Loved it so much that I started reading Purseforum every day; stalking every picture posted by the lucky owners who are obviously not broke and obviously buy bags for a living. And the celebrities who wear them became my idols. Being a college student limited my savings and passion for the expensive bags I knew I'd kill myself for spending the money, I just had to brush it off and get on with life. Fast forward last year, I found out that Marc Jacobs has decided to discontinue the bag - the Stam bag - and I was crushed. There goes my chance to ever hold it in my arms! So desperate to own it, I started looking for the bag online; trying to find the best deals for the best color I wanted, etc before they sold out. Nothing gives. I found none that I like, and even when I did, it's crazy expensive and just didn't make sense to me. Getting married (hmmph) hampered my need to own it even more - I needed to prioritize. Even so, now and then I still drop by MJ branch in KLCC just to see if they had one at cheaper price. The most discount they gave was 30% - still ridiculously pricey to me. "Jom check out JPO! Along-alang dah lalu"
But obviously he knows me better lol. So we did. And we went to the newly opened MJ store - saw the Stam bag in a gorgeous dark purple shade, tried it on, asked for the price. It was at more than 50% off! MORE THAN. I still remember my reaction when the salesgirl showed me the price tag; it was like me seeing Tom Hiddleston in real life hahaha. The salesgirl said they're having the opening sale hence the big reduction, and also because the Stam is discontinued - still, the price is so, so much lower than the one in KLCC. So glad I waited, all those years.
" You have a sickness." Fine, maybe I do. Hmmph. Hi zatil, how much is the bag? Safa & Mimi, yes around that :) Not sure if JPO still has it but worth a check!